Refrigerators are important and convenient appliances for modern-day living — and without them, things can become quite a bit more complicated. Perhaps your refrigerator seems a little warmer in one area than another, it is making a loud noise, or leaking water — these are all signs that something is up with your refrigerator. So, when do you know to call the refrigerator repair person or ditch it for a new one completely? Refrigerator repair is just one more service we provide you at Air Nation. We take our time to assess your appliance and always offer the best outcome to our customers. 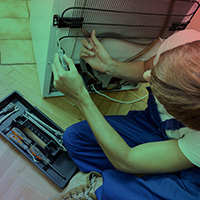 To learn more about what entails a refrigerator repair or replacement, join us in today’s post. When routine maintenance is talked, about most homeowners know about their HVAC systems and garage door, but how often do you include your refrigerator? Yearly refrigerator maintenance prevents repairs and extends the life of your appliance! At any point in time, your refrigerator houses hundreds of dollars worth of goods — and when it decides to go, it is not only a waste of resources, it never comes at an opportune time! When an appliance is on the fritz it will often give you signs — just like a person has signs and symptoms when they are sick. Read below for the tell-tale signs that your refrigerator may need a little TLC! This may take a couple of cycles, but if you see your energy bill slowly and steadily begin to rise, it could be the result of your refrigerator sucking energy. Different refrigerators consume different amounts of energy, but if you have a common one with the refrigerator and freezer being side to side, their longevity is typically five to seven years and within this range, it could be less energy efficient. It is never a good sign when you open your refrigerator door only to discover water droplets lining the interior — this is a major sign you may need a refrigerator repair. When there is moisture inside, this indicates that it is not cooling down effectively. Before calling a professional, you can inspect the rubber sealing around the refrigerator door to see if it needs to be replaced — sometimes it is just the seal that prevents the door from closing properly, thus causing condensation. If the rubber seal is intact and indeed closing properly, then you can address your concern with your local appliance repair company. If your refrigerator is buzzing, you will know it! Though all refrigerators make a certain amount of noise, if it louder than usual and paired with a buzzing noise, a number of issues could be cropping. Perhaps the cooling fan is just dirty and the fan blades are not spinning as a result, but a more serious issue such as a worn-down compressor could be on its way out. This may seem like a no-brainer, you would know when your food is rotting right? It is not so simple. Sure your produce may be expiring extremely fast, but what about foods that last longer? Foods such as vacuum-packed bacon, milk, or cheese, how are they holding up? If things are beginning to go bad before their expiration date, there could be an issue with the refrigeration component. Freezers are meant to freeze, however, a freezer should never have crusty or chunky pieces of ice in its interior. If your freezer is working correctly, you should never really have to use the defrost function. If you are finding that your freezer is overly icy and you are defrosting more than twice a year, this is a sign that you may need a refrigerator repair. While this doesn’t seem serious it can become a bigger issue down the road — so call in for a refrigerator repair — the sooner the better! 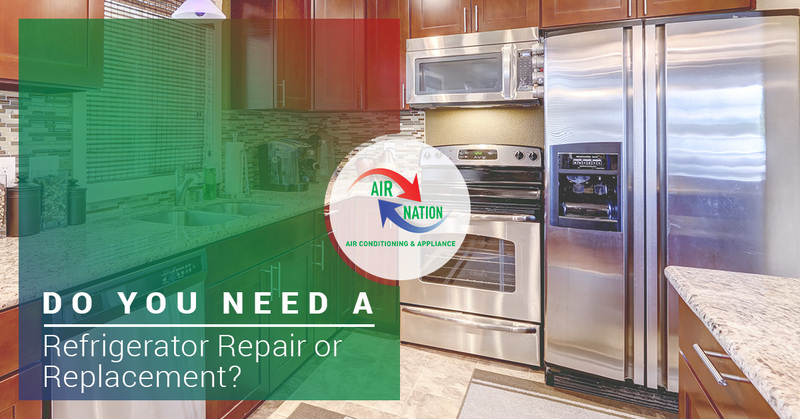 Air Nation Does Refrigerator Repairs! Is your refrigerator giving you signs it’s on its way out? Extend it a lifeline and partner with us today for a refrigerator repair!